Shri Ravi Shankar Prasad taking charge as the Union Minister for Communications and Information Technology, in New Delhi on May 27, 2014. Through: Mr. Uday Gupta and Mr. M.K. Tripathi, Advs. Through: Dr. Ashwini Bhardwaj, Adv. 1. Dr. Ashwini Bhardwaj enters appearance on behalf of respondents.He seeks and is granted six weeks to file a counter affidavit. 2. Rejoinder, if any, be filed before the next date of hearing. 3. To be noted, this matter has been transferred to this Court by virtue of order dated 13.12.2013 passed by the Supreme Court in Writ Petition Civil No.1003/2013 . 4. A perusal of paragraph 3 of the order is indicative of the fact that the Supreme Court in order to avoid multiplicity of proceedings has transferred the matter to this Court. 5. Counsel for the petitioner is advised to ascertain as to whether any writ petition has been filed in any other High Court and, if that be so, whether the aforementioned order of the Supreme Court has been brought to the notice of the concerned High Court. 6. Counsel for the petitioner shall do the needful before the next date of hearing. 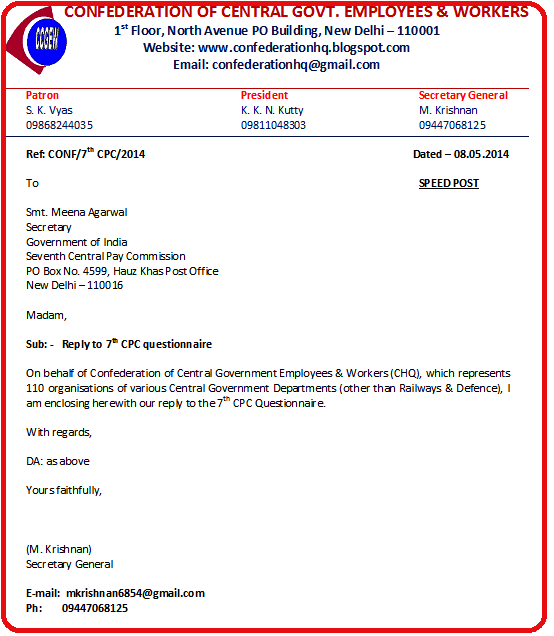 AN ACT to establish a mechanism to receive complaints relating to disclosure on any allegation of corruption or wilful misuse of power or wilful misuse of discretion against any public servant and to inquire or cause an inquiry into such disclosure and to provide adequate safeguards against victimisation of the person making such complaint and for matters connected therewith and incidental thereto. Com. Barda Bhattacharya, former Addl. Secretary General, All India Audit & Accounts Association and Veteran leader of Central Government Employees passed away today morning at Kolkata. Confederation National Secretariat conveys its heartfelt condolences. We are enclosing herewith reply to Questionnaire on behalf of National Council (Staff Side) JCM for kind consideration of the Commission. New Delhi: The Delhi High Court on Tuesday declined to stay the functioning of the Seventh Pay Commission while hearing a plea that challenged a notification on inclusion of a former IAS officer as a member of the panel. Justice Sudershan Kumar Misra also issued notice to the central government on the plea filed by retired members of the all India Services, central civil services and armed forces against the government's February 28 notification constituting the commission. The petitioners argued that inclusion of a former Indian Administrative Service officer, Vivek Rae, in the four-member commission give rise to a "real likelihood of bias" on his part to give a favourable recommendation to the IAS. 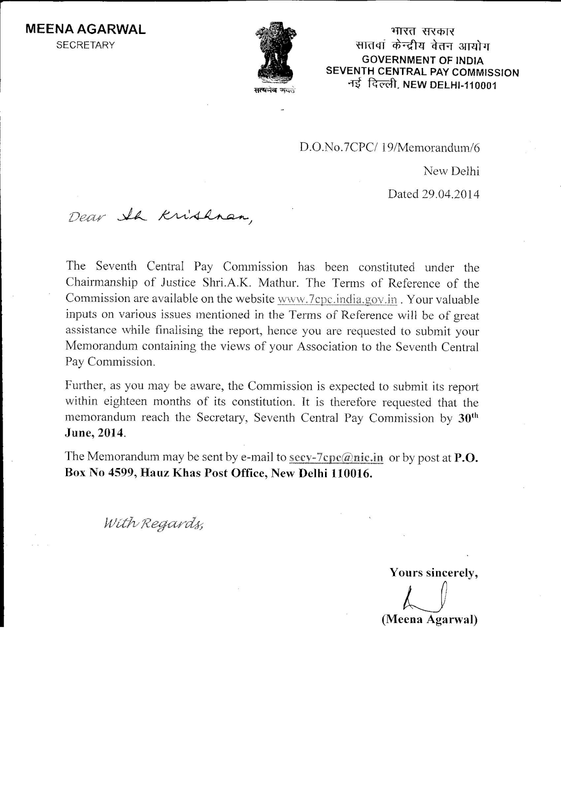 The petition said: "The impugned resolution, by retaining the practice of including a member of the IAS as a member of the commission has given rise to a real likelihood of bias on the part of such member in favour of maintaining the status quo, under which the IAS enjoys a position of special privilege in respect of pay fixation." Rae has a directed pecuniary interest in the recommendations of the commission, as it would also determine his pension and retirement benefits, alleged the plea. The petitioners further questioned the practice of previous pay commissions providing an "edge" in pay scales to members of the IAS over other members of the AIS and other central civil services including India Forest Services (IFS), Indian Police Service (IPS), Indian Revenue Service (IRS), and all other group A central services. "Past report of the commission rise to a reasonable apprehension that the reason for the repeated rejection of the demands for parity of other services in the AIS with the IAS is attributable to the fact that the commission has always comprised of a member of the IAS," the petition submitted. Central government counsel, however, argued the commission was not a "one-man show" and that it recommendations inturn have to go through scrutiny of the government and Rae was included in the commission because of his wide experience in the field. Former Supreme Court judge Justice Ashok Kumar Mathur is the chairman of the commission and former petroleum and natural gas secretary Rae, National Institute of Public Finance and Policy (NIPFP) Rathin Roy, OSD in finance ministry's expenditure department Meena Agarwal are the members.